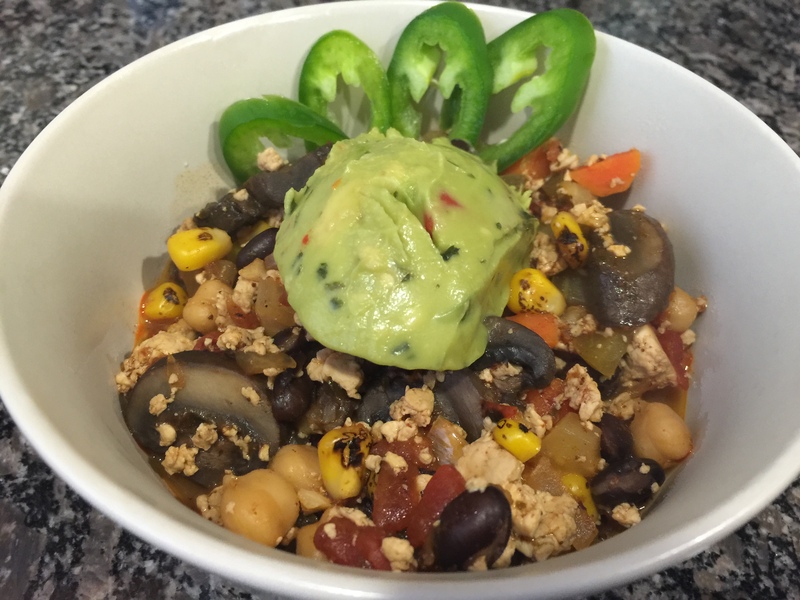 Recipe: Vegan Chili with tofu. – Recipes & Food Writings. 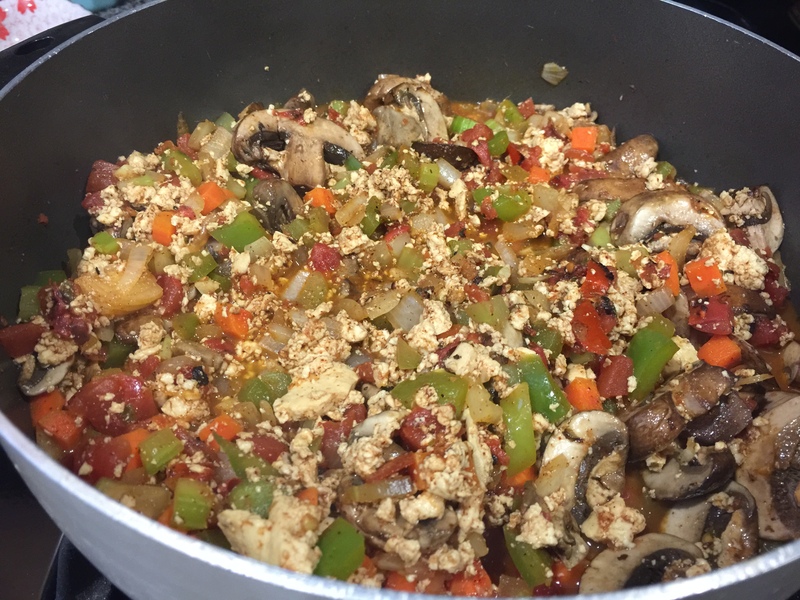 Recipe: Vegan Chili with tofu. Tofu is one of those things where you either really like or you hate it. I honestly think people who don’t like tofu hasn’t tried it well seasoned. But then again, I could be biased since I grew up eating the stuff and love it. 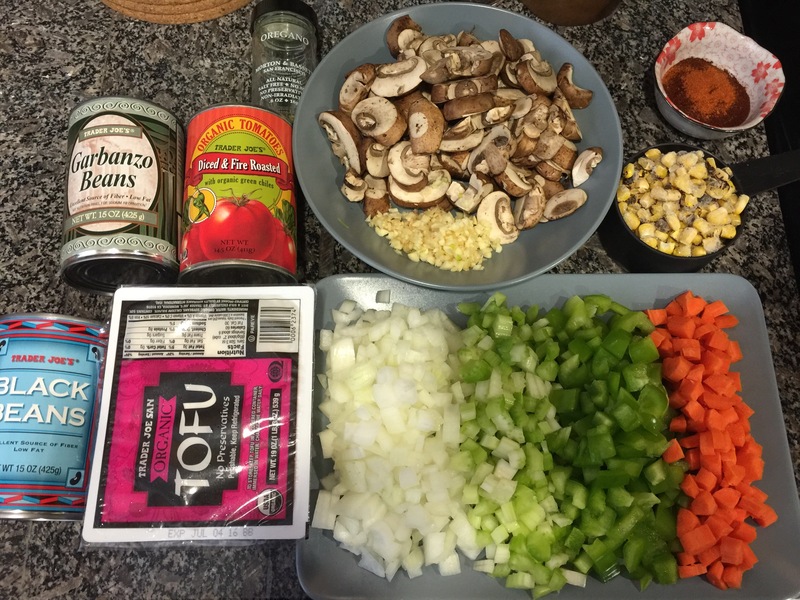 This recipe for vegan chili is hands down my favorite since it’s easy, filling, and delicious. Also, if there’s anything in the recipe that you don’t like – feel free to leave it out or substitute it with something else you prefer. If you don’t like mushrooms, that’s okay! Take it out and add diced eggplant or some other veggie instead. There’s quite a bit of ingredients, but it comes together pretty quickly once you get all the chopping and slicing of everything out of the way first. 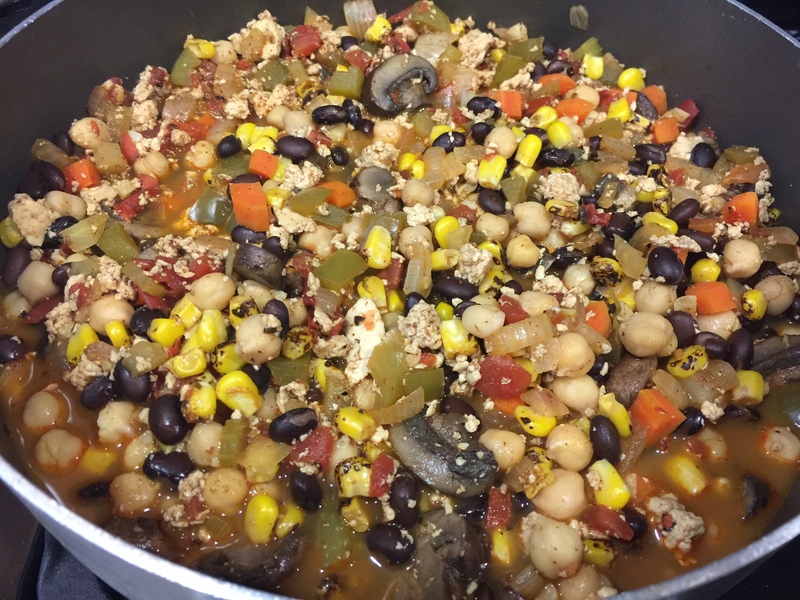 For the recipe, I put tofu, yellow onion, celery, green pepper, carrots, brown mushrooms, garlic, corn, canned diced tomatoes, black beans, garbanzo beans (chick peas), and a spice mixture. First, let’s start with the tofu. It doesn’t matter if you get firm or extra firm, but I highly recommend not using soft tofu. 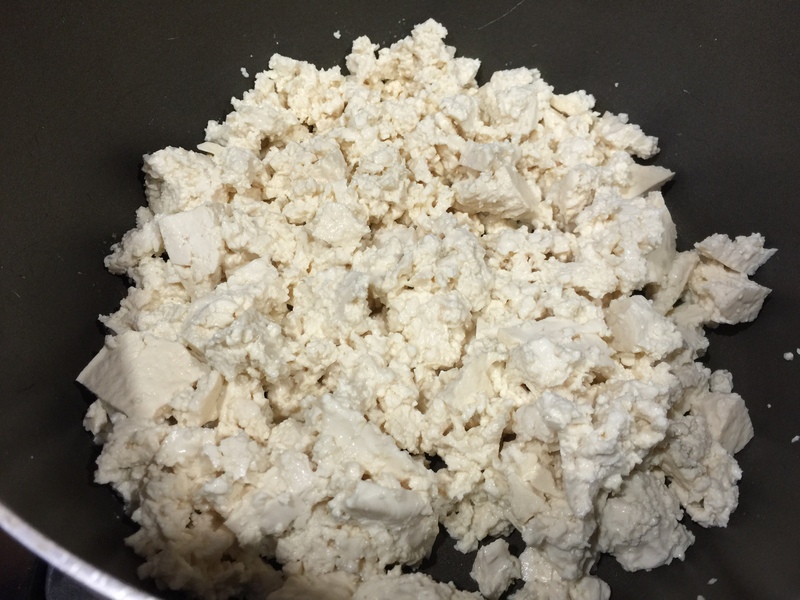 Drain and rinse the tofu, patting it dry, and in a medium sized pot, break up the block into crumbles. You can make it as chunky or as fine of a crumble as you want. I like a bit of both. 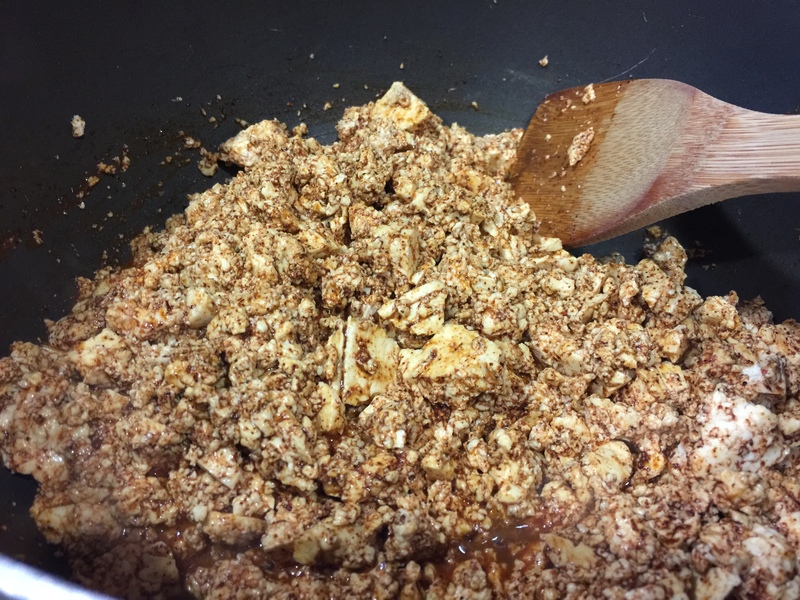 Once the tofu is crumbled up, add some vegetable oil, a healthy sprinkle of salt, and a spice mixture which has chili powder, ground cumin, ancho chili powder, and cayenne pepper. Cook this on medium heat for 5-10 minutes. This is to ensure that the flavoring gets into the tofu so it’s not bland. After the tofu has cooked, add the onions, celery, green pepper, and carrots to let cook together for a while more. Next, add in the sliced mushrooms, garlic, and the can of tomatoes – juice and all, plus some dried oregano. When it comes to canned diced tomatoes, there’s all sorts of different types and seasonings you can get with them. 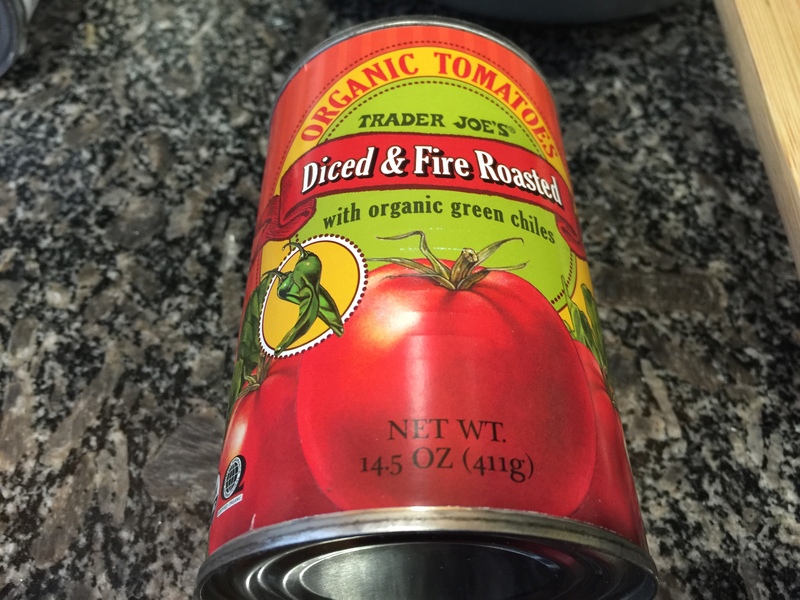 For this chili recipe, I like to use fire roasted tomatoes with green chiles. It adds more flavor and a nice smokiness to everything. The only type of canned diced tomatoes I wouldn’t use would be something flavored with basil. Once everything has simmered together for nearly an hour, add the beans and corn. For the beans, you can use whatever you want. I like to use a mixture of black beans and garbanzo beans (chick peas). You can use all black beans, you can use all garbanzo beans, you can use pinto or kidney beans if you want too. Just make things how you like it. 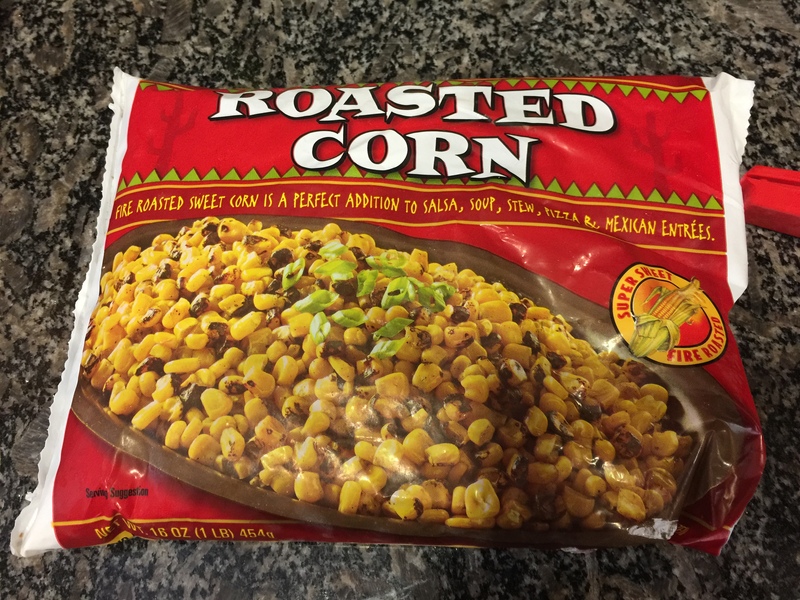 For the corn, I used this type found in the freezer section. It doesn’t matter what type of corn you use – it can be canned, frozen, sweet corn, white corn, or yellow corn. Just use what you like! I used the roasted corn because it adds a bit more smokey flavor to the chili. You cook up everything together and that’s it! You don’t need to add any broth or water because all the liquid comes out from the tofu and veggies. If you want to add some fresh cilantro to it, mix it in at the end. I’m not fond of the flavor, so I leave it out. Remove tofu from package and rinse, patting dry with a paper towels. Crumble into a medium pot. Add vegetable oil, spice mixture, and a generous sprinkle of salt. Cook over medium heat for 5 to 10 minutes. Add in the onion, celery, green bell pepper, and carrots. Mix well and cover, cooking for 10 minutes. Add in the mushrooms, garlic, canned diced tomatoes (including the juice), dried oregano, black pepper and another sprinkle of salt. Mix well and cover. Reduce heat to low and simmer for 45 minutes. Add in the canned beans and corn, mixing well. Cover and let simmer for another 30 minutes. Check for seasoning, adding more salt if needed before serving. Garnish and serve as you like! If you’re a vegetarian, you can add cheese or sour cream or both! Since I wanted to keep this vegan, I just added a dollop of guacamole to have something creamy to eat with it. And fresh jalapenos add a nice spicy crunch. Be warned, this is very delicious, but also VERY filling.